EZnet Scheduler is a powerful and customizable online appointment scheduling program that aims to help businesses of all sizes eliminate no-shows, improve employee efficiency, save money and time, and increase profits. This web-based application can adapt to the needs of any industry, and that is why it can be used by all industries which include medical and healthcare, education and tutorial, animal/pet services, financial services, property management, real estate, restaurants, spas, and more. EZnet Scheduler allows users to capture all the information they need when they schedule appointments with their clients. To eliminate no-shows, the program lets them reach out to clients through text, email, or voice messaging to remind them of their upcoming appointments. Notifications can also be sent out to employees when they are scheduled for appointments. EZnet Scheduler comes with a drag-and-drop user interface which makes it easy for users to create schedules. They can also apply color codes to the scheduler. Last but not least, the online appointment scheduling program is mobile-friendly, enabling users to manage appointments anywhere they are. Eliminating no-show appointments is one of the benefits that users can get with EZnet Scheduler. The web-based application provides them with the capability to reach out to their clients so they won’t be missing out an appointment. To remind clients of their scheduled appointments, the application allows users to send free unlimited text messages which they can customize. They can also reach out to clients by sending email reminders. In addition, EZnet Scheduler is built with a system that automatically calls clients so they can confirm, cancel, or reschedule their appointments. Thus, clients will be able to receive automated voice messages at any time and wherever they are. EZnet Scheduler delivers a feature which allows employees to communicate and share information with each other as they handle the appointments scheduled for them. The application allows them to leave notes on appointments as well as attach files. This way, they will be reminded of their tasks and will be able to access the important documents they need for their appointments. EZnet Scheduler provides users with easy and flexible ways to schedule appointments. Having a drag-and-drop interface, they can easily set up the length of an appointment as well create recurring appointments. They can also create multiple appointments within the same time slot. If they have multiple offices, the application allows them to schedule appointments for all of those offices from a single scheduler. Three-Level Scheduling is among the most powerful features offered by EZnet Scheduler. Here, they can schedule appointments by attaching three information which includes the name of the person who will do the task, the service or task the person will do, and the specific resources that will be used for doing the task (e.g., classroom or lift). While EZnet Scheduler makes it easy for users to schedule appointments, it also makes scheduling on the part of their clients a breeze. This is because the application permits them to create their own schedules online. Interestingly, they can schedule appointments 24/7; enabling them to do it even after hours, during vacations, or on holidays. 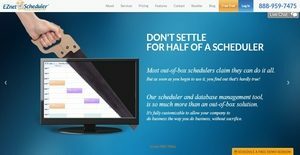 Aside from allowing clients to schedule appointments online, EZnet Scheduler permits clients to leave their own comments and reviews on the scheduling page. Potential customers can read the comments and reviews that come from satisfied customers, thereby enabling users to promote, grow, and expand their business. EZnet Scheduler’s online scheduling page can also be used to send notifications to customers to inform them about a new product, an upcoming event, or a sale. If you are considering EZnet Scheduler it might also be sensible to investigate other subcategories of Best Appointment Scheduling Software listed in our database of SaaS software reviews. Organizations have unique needs and requirements and no software platform can be just right in such a scenario. It is futile to try to find an ideal out-of-the-box software system that fulfills all your business needs. The wise thing to do would be to adapt the system for your unique wants, worker skill levels, budget, and other factors. For these reasons, do not hasten and subscribe to well-publicized leading applications. Though these may be widely used, they may not be the best fit for your unique wants. Do your research, check out each short-listed platform in detail, read a few EZnet Scheduler reviews, call the vendor for clarifications, and finally select the application that offers what you require. How Much Does EZnet Scheduler Cost? We realize that when you make a decision to buy Appointment Scheduling Software it’s important not only to see how experts evaluate it in their reviews, but also to find out if the real people and companies that buy it are actually satisfied with the product. That’s why we’ve created our behavior-based Customer Satisfaction Algorithm™ that gathers customer reviews, comments and EZnet Scheduler reviews across a wide range of social media sites. The data is then presented in an easy to digest form showing how many people had positive and negative experience with EZnet Scheduler. With that information at hand you should be equipped to make an informed buying decision that you won’t regret. What are EZnet Scheduler pricing details? What integrations are available for EZnet Scheduler? EZnet Scheduler supports data integration with any program or device. If you need more information about EZnet Scheduler or you simply have a question let us know what you need and we’ll forward your request directly to the vendor.